New Reprint by New Publisher! This popular book has been finally reprinted by a new publisher! 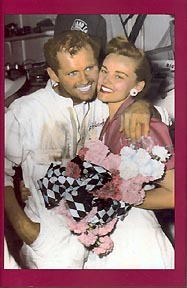 Author Dori Sweikert, wife of the 1955 Indianapolis 500 winner Bob Sweikert, wrote about their lives together. This is love story set in a auto racing scene. Dori's love for Bob has never ended. She fell in love in high school and sixty years later her love is still there. Read how fate brought their lives together in high school and how fate separated there lives and later how fate brought them back together. Read how the happy day of winning the 1955 Indianapolis 500 was over shadowed by the death of two-time winner Bill Vukovich. In June 1956, Bob Sweikert was fatally injured during a sprint car race in Salem Indiana. Dori was at the race and her grief comes out in the book. Many wanted a reprint of this book but the original publisher never did. A new publisher was found and brought this book out again. Now is the time to purchase the new book before they are gone again.